Use this cookie decorating tutorial to learn how to make decorated sugar cookies that look like cornucopias -- perfect for Thanksgiving! I have a confession to make. 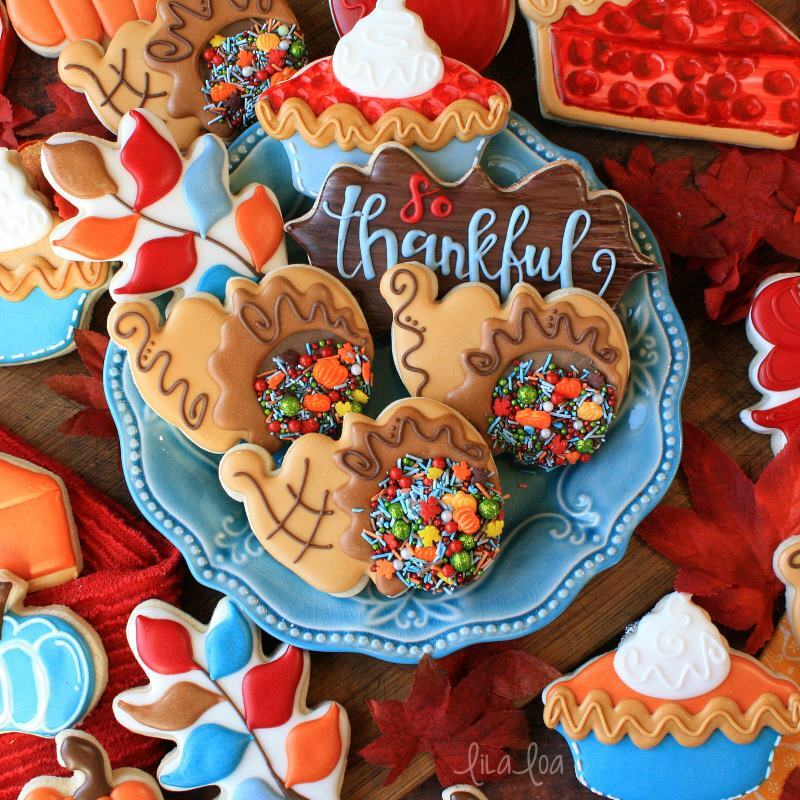 I've made a cornucopia cookie tutorial every year for the last three years. THREE YEARS. And do you know what happens? Somehow Halloween turns into February overnight. Every single time. It's like some kind of conspiracy. But not the kind of conspiracy that involves ninjas and spies and 2 dozen monkeys from the zoo wearing neckties and dancing the hula while simultaneously typing Macbeth on old school typewriters in Toledo. More like the kind that involves icy tundras of despair and whining children and endless repeated trips to the grocery store because I keep forgetting the ONE THING I was going to purchase. Oh wait...that's my actual life. Not a conspiracy. Thanks for reminding me. You guys are the best. If I'm being completely honest though, I'm kind of glad that I never got around to posting any of them until now because these are *definitely* my favorite cornucopias yet!! 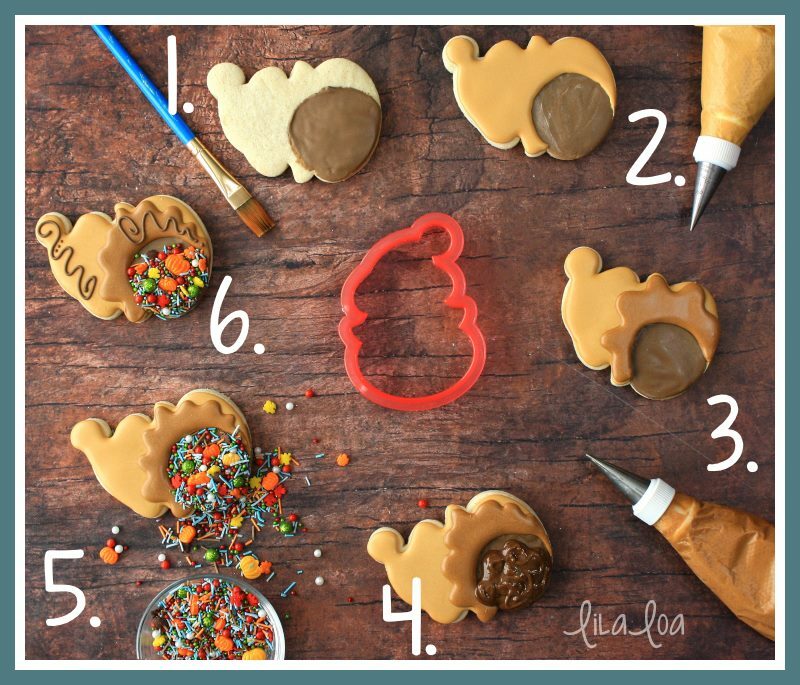 How to make decorated cornucopia cookies. Thin down some dark brown icing and paint it over the cookie where the opening of the cornucopia will be. This doesn't need to be even remotely perfect.Let it dry for at least 15 minutes. Outline and flood the cornucopia with a medium consistency tan colored icing, leaving a vaguely circle shaped opening at the front. Let dry for 15 minutes. Use a medium consistency brown icing to outline and flood the decorative edging around the opening of the cornucopia. Let everything dry for about an hour. Pipe some dark brown icing into the mouth of the cornucopia. Immediately cover with sprinkles. Let sit for a few minutes. Gently pour off excess sprinkles. Grab the cutters: CORNUCOPIA (It's actually a Santa cutter), LEAF, FULL PIE, PIE SLICE, BOW, SO THANKFUL, and TALL PUMPKIN. Grab the sprinkles: PUMPKINS, LEAVES, and SPARKLY SUGAR PEARLS. Make some EASY DECORATED TURKEY COOKIES to go with these cornucopias! 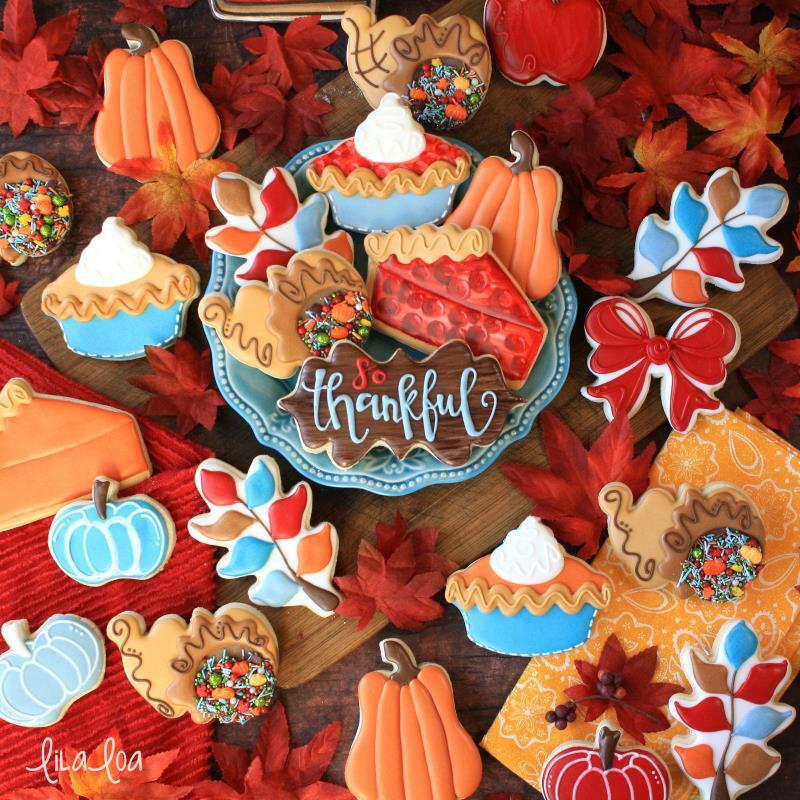 See how I made the WOODGRAIN ON COOKIES for the "So Thankful" cookie.